Welcome to Forest Cover No. 54. 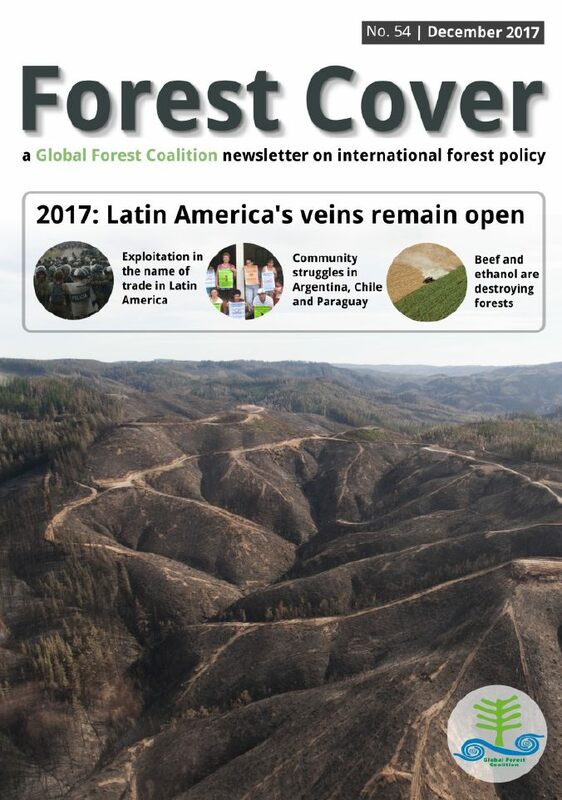 Forest Cover is Global Forest Coalition’s newsletter. It provides a space for environmental justice activists from across the world to present their views on international forest-related policies. This 54th edition of Forest Cover called “Latin America’s veins remain open,” a title inspired by Uruguayan writer Eduardo Galeano’s landmark book, has a special emphasis on Latin America. It exposes the pillaging of Latin America by the neoliberal trade and development model. It will specifically look at the impacts of commodity production and corporate free trade on forests, indigenous territories, and local communities in this region. As Argentina gears up for the World Trade Organization’s ministerial in December, and the EU Mercosur trade talks are projected to conclude at the same time, the dangers from this trade model to forests and communities become even more apparent and necessary to expose. Unsustainable livestock production, deforestation, monoculture tree plantations, excessive use of pesticides, expanding swathes of genetically modified soya for animal feed, displaced communities are just some of the destructive impacts that such trade deals will aggravate. This edition will showcase stories from Chile, Paraguay, Argentina, and Brazil. It will also analyse the two key trade deals WTO and EU–Mercosur and reveal the consequences on forests and communities.